The attack occurred in a rush hour on one of the city’s busy streets. 14 people were killed and 27 remain in hospitals as a result of a bomb attack in a trolleybus in Volgograd, Russia’s Public Healthcare Ministry reported. On Sunday, a terrorist attack was carried out on Volgograd’s railway station. 17 people were killed and over 40 injured. According to latest reports, five of them are in critical condition. 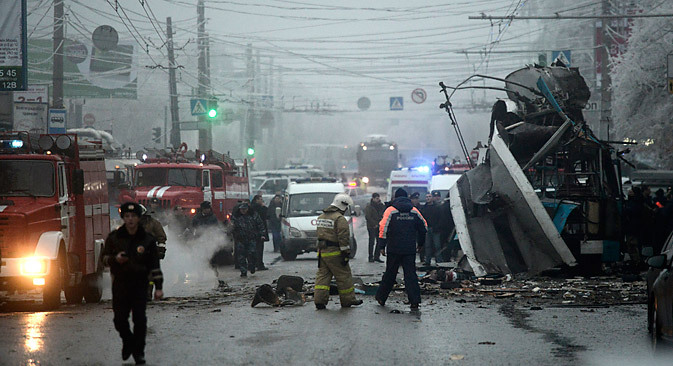 Another major terrorist attack occurred in Volgograd October 21, 2013: then, a bomb was set off in a commuter bus carrying over 40 passengers. Seven people died and more than 40 were injured. On Monday, the attack occurred in a rush hour on one of the city’s busy streets. As reported by Itar-Tass newsperson from the site of the incident, the blast occurred on Katchintsev Street of Volgograd’s Dzerzhinsky district. The trolleybus was en route N15 “Center — Seven Winds community”, where hospital N25 is located. On Sunday, the major parts of injured in the terrorist attack at the railway station were brought there. This was reported by Volgograd mayor’s spokesperson Mikhail Serenko. “It’s a major tragedy, the trolleybus was ripped to shreds; only the nose was left relatively intact. Conditionally speaking, the roof became the cupola of the blast,” he said. Russia’s President Vladimir Putin met with Alexander Bortnikov, and the head of Russia’s Federal Security Service reported about the explosion that occurred Monday morning in Volgograd, as reported by presidential spokesperson Dmitry Peskov. “Relevant reports also arrive to the president through other special services. The head of state has made all necessary instructions,” Peskov said. According to the official representative of Russia’s Investigative Committee Vladimir Markin, upon the explosion a criminal case under Article 205 (terrorist attack) and Article 222 (arms traffic) of the Criminal Code has been filed. “The trolleybus is heavily damaged. Investigators and criminalists of Volgograd Region’s Investigative directorate of Russia’s Investigative Committee are working at the site of the incident. Primary measures of investigation are being carried out,” Markin reported. The most probable version of the trolleybus blast in Volgograd is triggering an explosive device laid in the passenger compartment. “One of the probable versions is triggering an explosive device laid in the passenger compartment of the trolleybus. The criminal case is filed under “Terrorist attack” article,” the information center of the National Counter-terrorist Committee said. According to preliminary data, the attack in Volgograd’s trolleybus was carried out by a suicide bomber, as a source in region’s law enforcement bodies told Itar-Tass. “This is indicated by the character of the explosion and the typical bodily fragments found on the spot,” he said. The Main directorate of Russia’s EMERCOM in Volgograd Region opened a hot line: (8442) 23-03-18, 23-02-82, 23-02-73. Official representative of the region’s chief directorate of the Interior Ministry Svetlana Smolyaninova said that “the call center receives calls from alarmed citizens about new explosions on public transport”. “Each of these calls is checked by police officers. The last two messages about an explosion in a tramway near the Monolit stadium and a blast in a minibus taxi near the Voroshilovsky shopping mall resulted false,” she said. The directorate reports that groups of psychologists of Russia’s EMERCOM, of EMERCOM’s Southern regional center and regional directorate comprising 22 specialists are working at the site of the tragedy. An Il-76 jet of Russia’s EMERCOM equipped with five medical modules is ready to depart from Moscow. The 495th rescue center is heading to Volgograd. The Southern regional search-and-rescue detachment and the regional specialized firefighting and rescuing unit are ready to depart from Rostov-on-Don. Numerous city residents, who gathered behind the police cordon band at the site of the explosion, say that there were many students on their way to classes in the trolleybus. “There was an intense bang, then a lighting, and all the road was in smoke. The passersby at first didn’t understand what happened. But then, when they saw the crumpled frame of the trolleybus and bodies of the victims all around, they were horrified,” one of the eyewitnesses, Polina, said.